Prada now under the microscope for Tax Evasion? Dolce & Gabbana were under the tax spotlight in 2013, with allegations of tax evasion, and now it looks like 2014 has a twin situation forming. Forbes released an article earlier today claiming that Prada is under similar investigation for transferring assets out of the country. What's going on over there in Italy, folks? Let's get those dodgy tax situations in order. Honestly, does anyone want to imagine the world without Dolce & Gabbana or Prada around? We certainly don't. 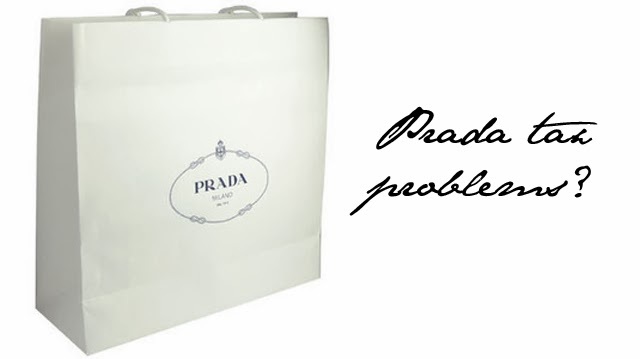 Seems there's no comment out of the Prada camp yet on all of these allegations. Let's hope it's all just a filthy rumour. Apparently, little whispers have been flying around for a while now about the situation. Forbes is suggesting that Prada follow in the footsteps of Dolce & Gabbana and confront this situation head on, thereby calling their fans to action in supporting the brand. Hell, guys, no need for them to say anything. We're team Prada, loud and proud! To read more in detail about all this tax allegation business, head on over to Forbes now.